Heading to Arizona or Florida for Spring Baseball? We’ve been training, and are ready to serve up a home run when it comes to satisfying your appetite. 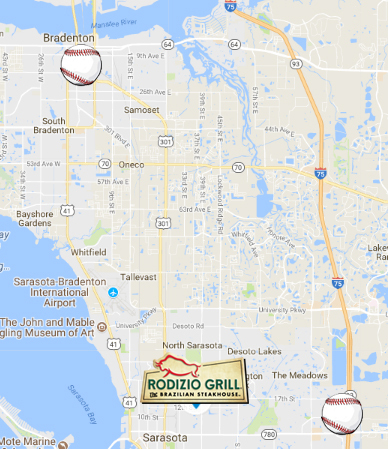 Rodizio grill has restaurants in Mesa, Arizona, Sarasota, Florida and Estero, Florida, close to all the Spring baseball training games. Our fun and festive dining experience features unlimited sides, a gourmet salad bar featuring an abundance of hot and cold items, and all you can handle of our seasoned Brazilian steaks. And whether you prefer cactus or grapefruit, a visit with us is the perfect way to finish off a day at the Ball Park. Looking for a restaurant near Sloan Park or Hohokam Stadium? Our Mesa, AZ restaurant location is just a short drive from these stadiums and the rest of the Phoenix-area Spring baseball action. Heading to JetBlue Park or Hammond Stadium in Fort Myers, Ed Smith Stadium in Sarasota or LECOM Park in Bradenton to enjoy all the Gulf Coast Spring training action? Rodizio Grill locations in Estero and Sarasota restaurant locations are nearby! 8017 Plaza Del Lago Dr.